WASHINGTON, DC – April 28, 2016 – The Construction Industry Round Table (CIRT) in partnership with the ACE Mentor Program of America hosted the 10th Anniversary National Design Competition earlier in the week where more than 60 high school students and 30 mentors from across the country came to the nation’s capital to present their design/construction projects before a panel of industry judges. A record 55 projects -- representing 20 Affiliates/Chapters – were entered into the competition. To recognize this milestone, for the first time ever a total of nine teams competed in two presentation steps: a semi-final round (for each project option) and a final national championship round. The championship round presentations were conducted before five judges and an audience of over 150 people as the three teams squared-off in a high-stakes finale pitting the survivors of the semi-final rounds. 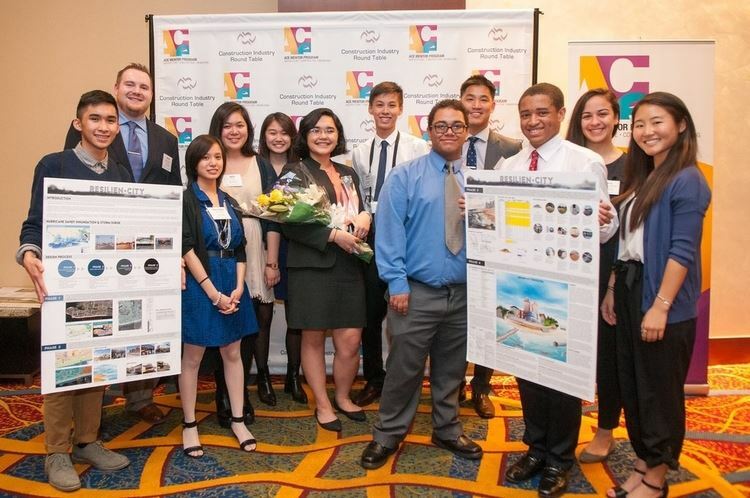 In the end, it was the project from ACE of Greater NYC/Team 30 for their “RESILIEN-City” (Shoreline Design challenge) that earned the sought-after national title and a $5,000 award. Second place went to ACE of Eastern PA for “The Last Stop” (Historical Revitalization challenge) with a $3,000 prize; while third place went to ACE Mentor Program of Northeast Florida/Orange Park HS Team for “Unity Bridge” (Bridge Design challenge) and a $2,000 prize. A special award was also given to a non-finalist team for the “Best Presentation Boards” ($250 award); which went to ACE Mentor Program of Seattle, WA for its entry “Sound Connection.” CIRT also recognized the Greater Houston area Affiliate for having the most entries in the competition (10 total). "The energy, enthusiasm, and passion the nine teams brought to the 10th Anniversary program made it a very special and memorable event; one we were very pleased to host on behalf of the entire design and construction community. If this is any indication of the kind of character and diversity we are attracting to our ranks, then the future of our industry will be in good hands!” stated Mark A. Casso, Esq., NAC, President of CIRT.